Cardioversion is a medical procedure used to convert an abnormal heart rhythm to a normal rhythm by giving the heart a brief electrical shock. The electric shock causes the heart cells to contract simultaneously, disrupting the abnormal rhythm and allowing the heart to restore a normal heart beat. Cardioversion is most commonly used to treat persistent atrial fibrillation or atrial flutter when anti-arrhythmic medication alone does not correct the rhythm disturbance. 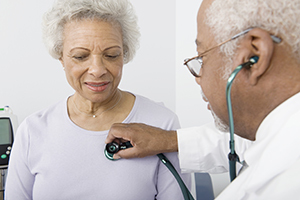 Patients may need to continue their anti-arrhythmic medication after the procedure to prevent the abnormal heart rhythm from returning. Cardioversion is performed as an outpatient procedure in the hospital. Adhesive patches with electrodes are applied to the chest and sometimes the back. The electrode patches are connected by a cable to a defibrillator, which delivers the electric shock. Patients will be given an IV medication for sedation to prevent any discomfort with cardioversion during the procedure. After the patient is sedated, the physician will charge the defibrillator and deliver the electric shock to the heart muscle. The electric shock may be repeated with a higher energy level if the first attempt does not correct the abnormal rhythm. The sedative used during the procedure is effective at eliminating any discomfort for the patient but short-acting so patients are typically able to leave the hospital about one to two hours after the procedure. Do not eat or drink eight hours prior to the procedure. Do take your regularly scheduled medication with a small sip of water. If you are diabetic, talk to your physician about insulin or other medication dosing prior to the procedure. Do not apply lotion or ointment to your chest or back since it may interfere with the adherence of the patches. Because of the sedation used, you will need to arrange for a ride home from the hospital. You should not drive or operate heavy machinery for the remainder of the day. You may experience minor skin irritation where the patches were applied. This can be treated with a topical steroid ointment to reduce the discomfort. Note: Sometimes a trans-esophageal echo (TEE) is required prior to cardioversion to check for blood clots in the heart. This is a short procedure in which your throat is anesthetized with a spray. A small echo probe is inserted into the esophagus and positioned behind the heart. The probe is removed after pictures have been taken. If a clot is present, the cardioversion will be delayed for several weeks. Your doctor will inform you if a TEE is necessary prior to your procedure.